Chelmsford, Mass. – May 22, 2018 – Broadcast Pix today announced the City of Mankato, Minn., has installed a BPswitch™ FX integrated production switcher as part of an upgrade to HD production for its city council and school district meetings. Installed in mid-April, the new system has simplified the production workflow and improved the quality of meeting coverage. About five years ago, the Mankato City Council and Mankato Area Public School Board were moved to new chambers, but most of the old video equipment was transferred to the new space. As a result, the city had three aging SD cameras in its council chambers and outdated hardware in its control room. Located in its own small room, the control room is separated from the chambers by a large window. The area used to be crowded with a switcher, CCU, three monitors, and other equipment. Now, the uncluttered workspace only has a keyboard, mouse, and two touchscreens. Meeting coverage is available locally on public access channel KTV, and is streamed live (and is available on-demand) on the city’s website. The meetings are recorded to the Broadcast Pix for archive while the system simultaneously outputs a live stream for the web. Instead of a traditional control panel, Mankato uses the Broadcast Pix Commander™ touchscreen interface. Designed for non-technical personnel, Commander offers intuitive controls to simplify switching, camera control, and the use of graphics, clips, and graphics. The personnel responsible for Mankato’s meeting coverage are not video professionals, but they are able to produce high-quality meeting coverage by using the touchscreens. 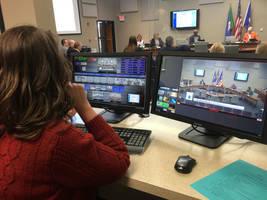 The system was installed by Mankato-based Video Services, Inc., which provided training and built lower-third graphics for participants in both the city council and school board. The new setup also includes three Panasonic HD PTZ cameras, which are controlled through the Broadcast Pix. Two cameras are positioned in the back of the room; one provides a wide shot of the council and presets of several council members, while the second has presets for the other council members. The third camera was installed in the front of the room and focuses on the guest speaker table. The BPswitch can also display the meeting agenda or other visuals from a connected laptop. Presets are used to follow the action, but the cameras can be adjusted on the fly to fix headroom or other issues.